Corpus Christi Memorial Coliseum is one of 12 sites that Preservation Texas, Inc. has named to its tenth anniversary retrospective list of Texas’ Most Endangered Historic Places. Originally named the to the 2004 list of Texas’ Most Endangered Historic Places, it is designated a lost site on the 2013 list. Preservation Texas officials announced the selections on the steps of the Texas State Capitol on Preservation Day, February 20. The annual announcement is part of Preservation Day activities organized by Preservation Texas. Advocates from all over the state come to participate in informational sessions, meet with legislators at the Capitol and get an in depth look at lessons to be learned from the sites named to the list. 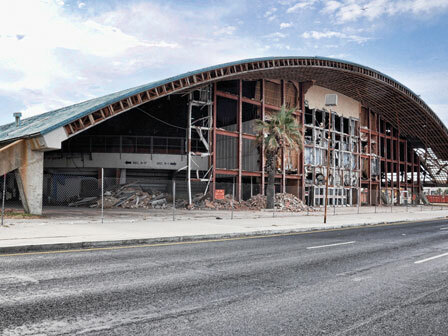 Serving as the site of events ranging from high school graduations to concerts by Elvis Presley and Willie Nelson, Corpus Christi Memorial Coliseum was an important part of community life since its completion in 1954 as part of a comprehensive plan for a bay front civic center complex. Noted architect Richard S. Colley designed the building in 1952 and the Design Award Jury of Progressive Architecture magazine noted the extraordinary pre-construction design. The Memorial Coliseum was dedicated in honor of the 400 men and women of Nueces County who died during World War II. The Coliseum suffered hurricane damage and the lack of maintenance allowed the building to deteriorate to the point that it was considered by some as an eye-sore. The city began to discuss demolition plans in 2009. Local architects and citizens who opposed the demolition showed strong support to save the structure and created a group called The Friends of the Coliseum. When demolition began in March of 2010 the Friends were granted a temporary restraining order against the city. The court battle continued for months and ultimately the coliseum was demolished in May 2010. This prominent water-front site sits undeveloped.